At the incredible People of Color Conference, I met Moses Rifkin, an outstanding physics teacher at University Prep in Seattle. I learned about the incredible unit he teaches his senior physics students that brilliantly brings lessons about social justice, privilege, and institutional racism into the physics classroom and leads to a measurable change in student understanding and attitudes about these subjects. Moses graciously agreed to write a series of guest posts for this blog about his curriculum and will be speaking to the Global Physics Department on February 18. For the first four years of my high school teaching career, I felt stuck. I care deeply about making the world a better place – duh – but felt that as a science teacher, my opportunities to do so were limited. I was jealous of my colleagues in English and History who got to talk every day in class about society and how it worked and how to be moral and caring and kind, whereas those conversations with students only happened for me outside the classroom. That I was teaching at a private school only made matters worse: my students weren’t learning about their own privilege (academic and, in most cases, economic and racial). I wanted to make my classroom a part of the solution, but wasn’t sure how. What’s a science teacher to do? Ten years later, I have come somewhat closer to finding an answer. I feel like it’s an answer because I’ve found a way to introduce my students to the ideas of racial and gender privilege, to the idea that our society is far from a meritocracy, and to broaden their conception of who (racially, gender-wise, etc.) does science to include a much broader slice of society; I say somewhat because it’s still very much a work in progress as I fumble my way upwards. 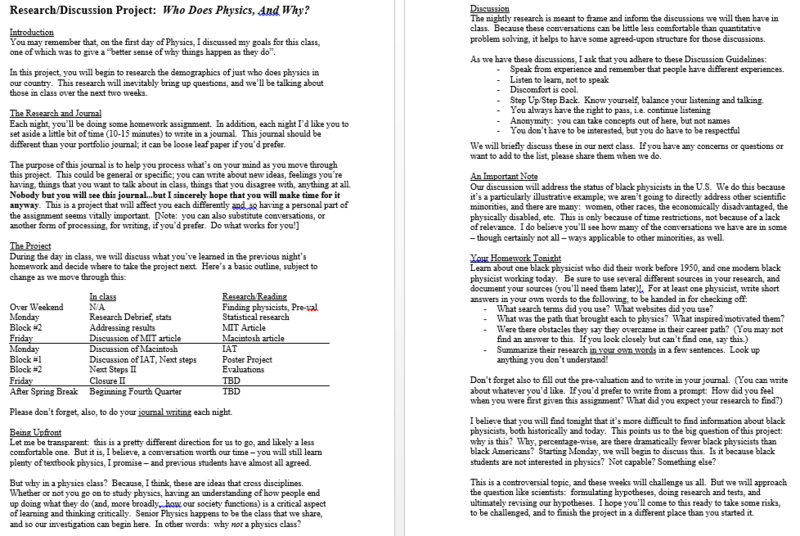 This article is meant as an overview of a six-day curriculum that I’ve developed and use with my senior physics students each year. For each of the days, I’ll give a brief synopsis of what happens in class and note the bigger-picture questions and goals that I hope to address that day. I’ve also included some resources that I use, though there are many more, and some narrative reflection on each day to help add some context. I’ve never had an opportunity like this to share what I do and if anything you read over the next few days is appealing or challenging or interesting or generative, I’d love to talk about it via e-mail (mrifkin@universityprep.org) or Twitter (@RiPhysKin). TL;DR: As science teachers, we have to take an active role in undoing the bias in our society. Don’t be afraid to try, and don’t wait until you know exactly what to do. Start a conversation, incorporate feedback to improve it the next time, and let me know how it goes. The project revolves, at least initially, around a question: why are there so few black physicists? 4.2% of physicists self-identified as black as of 2012, according to the National Science Foundation’s Minorities and Persons with Disabilities in Science and Engineering report; according to the 2010 Census, 12.0% of the population aged 25-64 identified as black. Physicists therefore make up a small percentage of the U.S. population (0.06%), but that percentage is 3.2 times higher among white Americans than black. Pre-project Homework: Do some research into one black physicist who worked before 1950, and one working today. Also, please fill out an anonymous pre-evaluation so that I can get a sense of the class’ beliefs (more on that at the end of this article), and start your reflection journal. Handout for the research/discussion project given to students. Overview of project: what are we doing? Why are we doing it in a physics class? What are possible reasons that might explain the lack of black physicists? Let’s make a list. What might it mean that googling “physicist” isn’t a good way to find a black physicist? Who are your inspirations? How do people end up doing what they do? What would we need to be able to address the validity of these hypotheses? Let’s get all the hypotheses out there, even the really uncomfortable ones (i.e. there’s a difference in IQ from race to race). Better to discuss it than to not. American Institute of Physics’ statistical research links and reports. I want to acknowledge that this unit, especially the start, is awkward. We’ve just finished a unit about energy, and suddenly class looks very different: desks are in a circle, ground rules are on the board, and we’re talking about society and race. I’ve chosen to do this March in part because I rely on the relationships and trust that have formed in class by this point, between the students and me among the students. I’ve found that it’s useful to tie this into the overarching class goal I stated on the first day of physics class – to give them “a better sense of why things happen as they do” – and to acknowledge that I’m asking them to take a risk. I’ve learned that they’re pretty game for that, with a few exceptions, and it’s my own discomfort that presents the biggest stumbling block. Into the fray! I do tell them, too, that we’re going to be focusing on race – specifically on the lack of black physicists– because it’s particularly illustrative of the bigger issues I’m trying to introduce. I believe that other focuses could be just as generative, or even more so, but we just haven’t gone that way yet. There are, in other words, plenty of other -isms that we could talk about, and I want to acknowledge that to them. I’ve done a better and better job of encouraging students interested in other scientific minorities (women, other races and ethnicities, the economically disadvantaged, the physically disabled, the LGBTQ community, etc.) to explore on their own over the years. 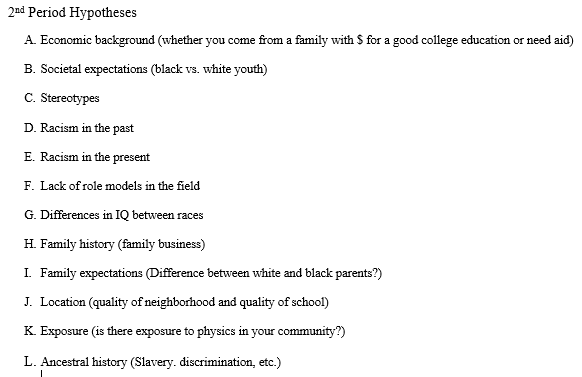 Initial hypotheses students came up with to explain why so there are so few black physicists. Day 1 Homework: take one hypothesis and try to investigate its validity. Also, write in your journal. Handout explaining second night homework. The next post will cover Days 2 and 3 of this unit, when students discuss research and statistics about race and privilege, and then work to understand systematic and institutional racism. 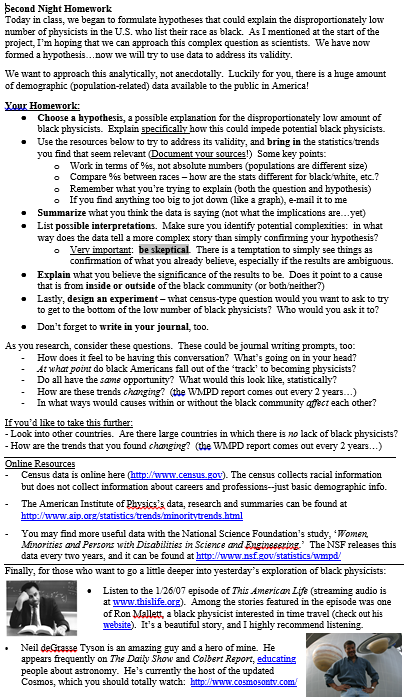 I use “black” instead of “African-American” because this is the language used by the National Science Foundation’s Women, Minorities and People with Disabilities report. I recognize that this isn’t a simple matter, and that recent research shows that it may actually make a significant difference. It’s exciting to see this post drawing some attention, and I’m hopeful that it reflects some interest among the science teaching community. I’d be especially thrilled if it started some conversation, so I’m trying to get the comments going. What questions or thoughts does this raise? What obstacles to this work exist in science classrooms specifically? How might this curriculum work (or not work) in your situation? You are raising vital questions in a field/area that is very different from others, such as the humanities – where these conversations are much more likely to occur in the classroom. Great courage and foresight. Thank you. Ignore the naysayers and haters, their time is done. Really enjoying this. Thank you both for sharing this. This lesson plan could also be easily adapted to the issue of male/female representation in physics. Check out this classroom teacher’s set of lesson plans on how to make Physics relevant to students of color. This 6-day unit is a great resource! Please share it, and the following information, with teachers and your black students. The U.S.A. needs more Black Engineers to continue our nation’s progress in STEM: science, technology, engineering and math. To help solve this problem, the National Society of Black Engineers (NSBE) is calling on 7th to 12th graders across the country to buckle down academically, set their sights on college, and commit to graduating with an engineering degree in 2025! The NSBE asks that 7th to 12th grade students pledge to achieve academic excellence in subjects such as algebra, chemistry and physics in high school. * Signers get regular checkup emails from the NSBE, tips for parents to keep children engaged, and scholarships.